1. Spray 5- to 6-quart slow cooker with cooking spray. Evenly sprinkle chicken with salt and pepper. In large skillet, heat oil over medium-high heat; add chicken, skin side down. Cook 5 minutes or until browned; transfer chicken, skin side up, to prepared slow cooker. 2. Add garlic, mushrooms and wine to slow cooker; cover and cook on high 2 to 3 hours or on low 5 to 6 hours. 3. With slotted spoon, transfer chicken to plate. Ladle about ½ cup liquid in slow cooker into cream, then add cream mixture back to slow cooker. In small bowl, whisk broth and cornstarch until dissolved; stir into slow cooker. 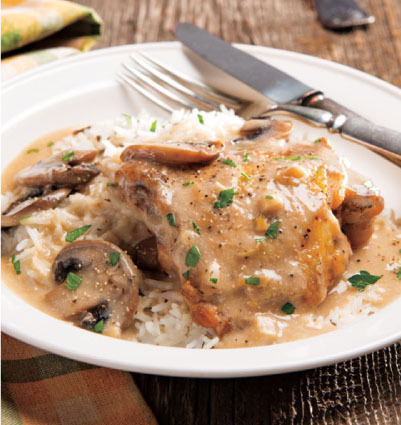 Return chicken to slow cooker; cover and cook 15 minutes longer or until sauce is thickened and chicken reaches an internal temperature of 165°. Serve sprinkled with chives and/or parsley, if desired. Serve alongside your favorite rice or noodles.